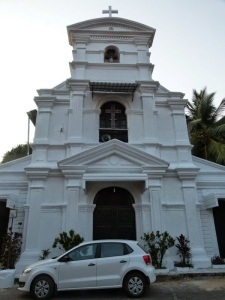 I first came across Fontainhas when I did an online search for self-guided walks in Goa. 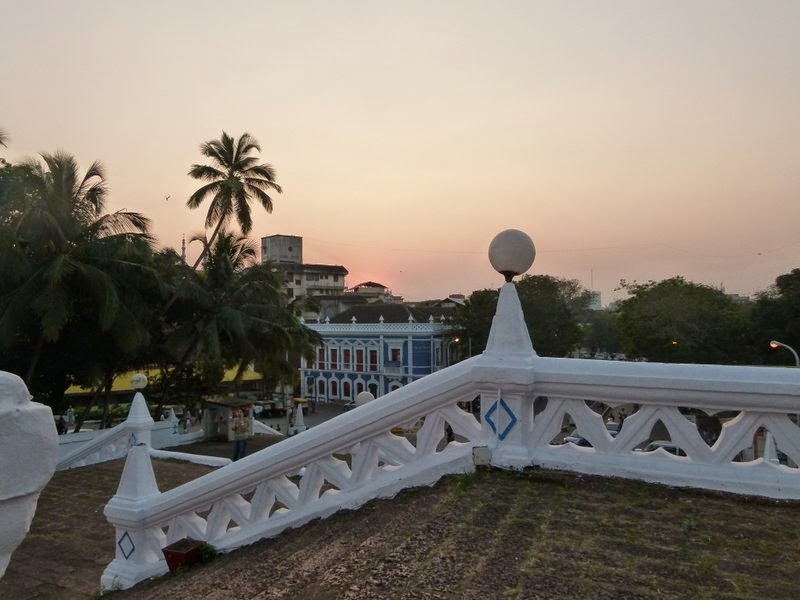 Located in Panaji, the capital of Goa, and also known as the Old Latin Quarter, Fontainhas is famous for its pretty and colourful Portuguese-style private residences. I was charmed by the description and the many images of Fontainhas available online convinced me that I should visit the area while in Goa. So after a day spent at Old Goa, I decide to head towards Fontainhas. There’s only one problem: my cab driver has no idea where it is with the result that we spend quite a bit of time in asking around and locating Fontainhas. It is an hour before sunset when we finally arrive at the Panjim People’s Inn, a landmark in the area and now an art gallery. I would have loved to see the exhibits at the gallery, but have to give it a miss as otherwise I will not be able to take advantage of the remaining daylight to see Fontainhas. A walk through Fontainhas reveals an old world charm in old, colourful houses with tiled roofs, narrow curving streets, vintage house signs, children playing football, a vintage car or two, gift shops selling souvenirs … The only thing that does not have a splash of colour is the local St. Sebastian’s Church; it’s whitewashed, neo-classical, single-towered façade is in stark contrast to the colored houses all around. In spite of the evening time, it’s quiet and peaceful and it’s easy to imagine a bygone era. If not for all the modern cars around me, I would probably have thought that I had travelled back in time. I wish I could have spent some more time at Fontainhas, but daylight is fading fast and there is nothing more that I can see. I drop into Marcou’s Artefacts to pick up some gifts for friends and family before I leave. My last view of Fontainhas is from the steps of the nearby Church of Our Lady of Immaculate Conception. Or rather it’s an imagined view as I can’t really see any of the buildings of Fontainhas and can only imagine them hidden behind the trees and out of sight. A colourful blue building with red windows opposite the church is a reminder of the wonderful evening that I have just spent at Fontainhas. Sudha is one of the founders of #TSBC (or The Sunday Book Club), a traveller, a bookworm, an editor, a communications consultant, an amateur photographer, a Classical music (Indian, Western, and Arabic) lover, a mythology enthusiast, a closet graphic designer… She claims that she is a nerd who is chained to her office desk during the day, reads books and listens to music in the evenings, and dreams of travelling to faraway lands at night. In between all this, she finds time to blog a bit. Fontainhas is the beautiful heritage part of Goa. It also has some nice stay options. Did you try the food around h ere? Not me personally, will have to check with Sudha if she did. Had been through this before at Sudha’s space and ever since had wanted to visit. Going through it has only reinforced the idea. Yup, one part of Goa that hardly anyone writes about. Yeah Fontainhas is beautiful. Was lucky to stay in Afonso Guest House in Fontainhas last December. It’s the ideal laid back Goa life. Just delightful!